Jonathan Cottrell serves entrepreneurs and their communities in love as a chief entrepreneur (Hopscratch), citywide connector (#yesphx, PHX Startup Week), marriage advocate (Love & Startups), and co-founder of several other startups: some public and some stealth, some successful and some not, but all interesting. Volunteer organizers are the lifeblood of Startup Week, so it’s high time we start to celebrate those individuals who have stood out in one way or another over the last 12 months. 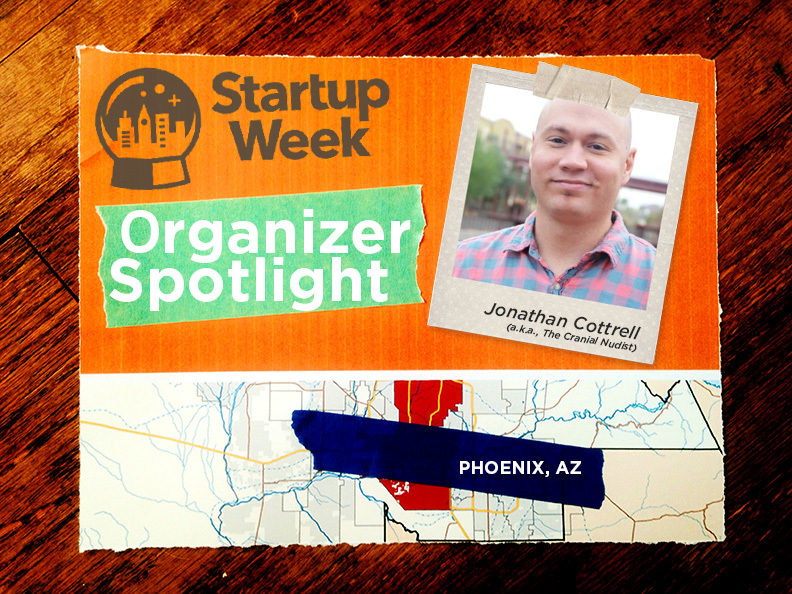 First up, is Jonathan Cottrell, lead organizer of Phoenix Startup Week. I first met Jonathan in Phoenix in December 2014. Andrew Hyde and I took a little trip down that way to meet the man who would be leading the way towards making Phoenix and all the cities in the valley a strong, cohesive ecosystem. Needless to say, Jonathan left quite an impression on us and we knew instantly that Jonathan was serious in his efforts to make Phoenix a startup hub by bringing the community together to share in a celebration of entrepreneurship. By accident, really. I had recently catalyzed a community effort to rally the region’s entrepreneur ecosystem, #yesphx, and planned to host an event around that idea. In doing so, I stumbled into learning that someone was already planning a Phoenix Startup Week in just a few months. I decided to chip in and help, but when the original organizer ended up leaving the country with his wife due to health reasons, he said it was basically up to me to make it happen. I knew the community would appreciate the effort, so I dove in, head first. What was the response to your Startup Week? What has it done for your community? With thousands of participants and over a hundred pieces of unique content over the week, I think everyone was surprised—pleasantly—about the response. A lot of amazing things came out of the week. We started hosting dinners every other month with collaborators from all parts of the ecosystem to talk about rolling the ball forward in Arizona. Out of that, we started a philanthropic seed fund in association with Salesforce’s Pledge 1% initiative, the Startup AZ Foundation, which is intended to serve as an evergreen resource that invests into the community. There was a lot more development of the #yesphx community effort, including some monthly happy hours intended to pull together the community, and those draw hundreds of people. But, most of all, I think Phoenix Startup Week really brought the community together to cheerlead what’s already happening here. Did the narrative about your community change because of your Startup Week? For example, did the community have an image of itself prior to Startup Week, but as the event happened their views changed towards the end? I’m cautious to say it “changed,” but I do think it amplified. There are always naysayers in every community, unfortunately. But I think that Phoenix Startup Week put the spotlight on all the positive aspects of our community. Most importantly, it drew in a lot of people that didn’t even know about the community that was already here and active. Even though there were good things already happening locally, I think the event created an energy that was not as pronounced prior. What was the best thing about having Startup Week in your community? The stories. I can’t even relay all of the amazing stories of individuals who got involved, met co-founders (including myself! ), and dove into the community as a result of Phoenix Startup Week. I tell people often that I care very little about the macro-picture of Phoenix or Arizona and what’s happening here. I care much more about the micro-stories that make up that macro-picture. It all comes down to people, and I can say quite confidently that Phoenix Startup Week changed lives—that’s what entrepreneurship does. What’s the future look like for startups and entrepreneurs in your town? Bright. There’s been a definite improvement in the overall tone of how people are talking about what’s happening. Every community has its opportunities to improve, and Phoenix is no different. But I can confidently say we’re on a solid trajectory moving forward, and I do think that Phoenix Startup Week played an important part of accelerating that trajectory. What’s something you wish you’d have known before organizing a Startup Week? How tired I would be afterwards. Ha! Kidding aside, the week went really well, but we did learn a ton through the process. 2016 is going to be much smoother, more entertaining, more impactful, and more inclusive than 2015. Always learning, always iterating. What advice would you give to someone interested in organizing a Startup Week? Just do it. We didn’t have some grand master plan or long-term strategy in mind when we started. We just did it. The community came together in amazing ways and the people who wanted to make it happen contributed their all to make it amazing. You’ll be happy you did it, I promise. The Startup Week Team is excited to work with Jonathan and his organizers again in 2016. Planning is already underway for their event that’s happening the week of February 22nd. Make sure to follow along as they announce speakers and events for what’s sure to be an amazing year two for Phoenix Startup Week!